We love ingredients that are good for you. Ingredients that fuel, sustain, satisfy, and heal your body. While mostly anything from the earth (save for poisonous mushrooms and a few other breeds of foliage) should be the bulk of what we feed ourselves with, there are a few foods that simply better than others.Â Sent to us from Edesia, the Roman Goddess of Feasting herself, superfoods are nutrient – dense, glorious, and meant to be consumed in abundance. All posturing, soap-boxing and mythological jokes aside, a superfood is one that is not only healthful, but may actually prolong your life when eaten regularly. They provide us with disease-reducing antioxidants and necessary vitamins and minerals. While there is no actual scientific definition for the term, blueberries, kale, goji berries and lentils are among the list of superfoods that contain this plethora of nutrients. Lentils can be purchased dry, canned, or pre-cooked and ready to toss into any recipe. 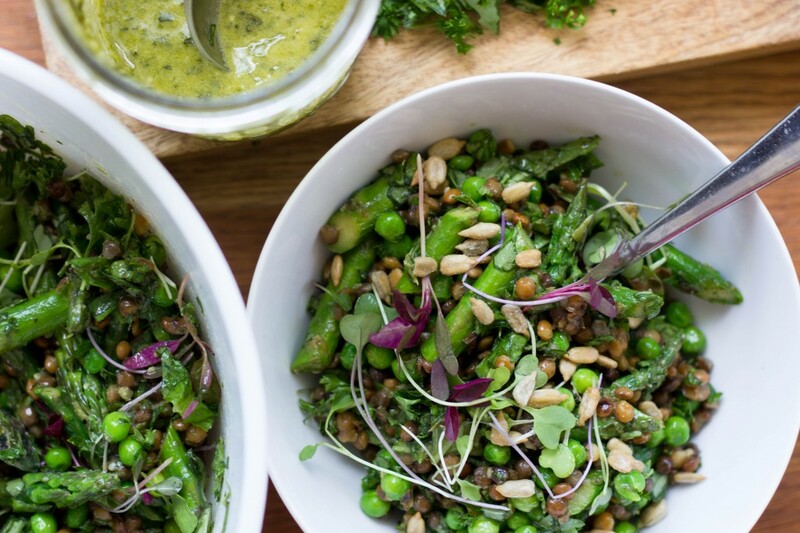 The high levels of fiber found in lentils can help lower your cholesterol, stabilize blood sugar, and are a great source of energy. 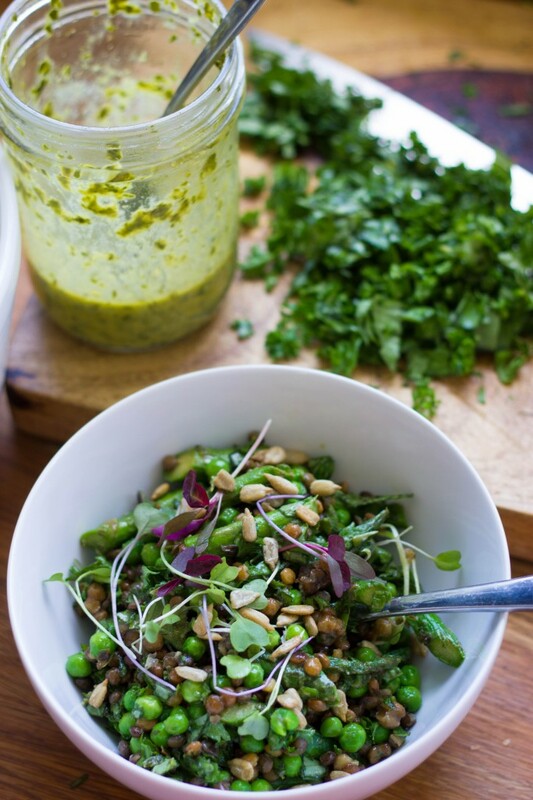 Consuming legumes like lentils is important in a plant- based diet because they contain plant proteins and high levels of iron, which may be lacking in vegan and vegetarian diets. 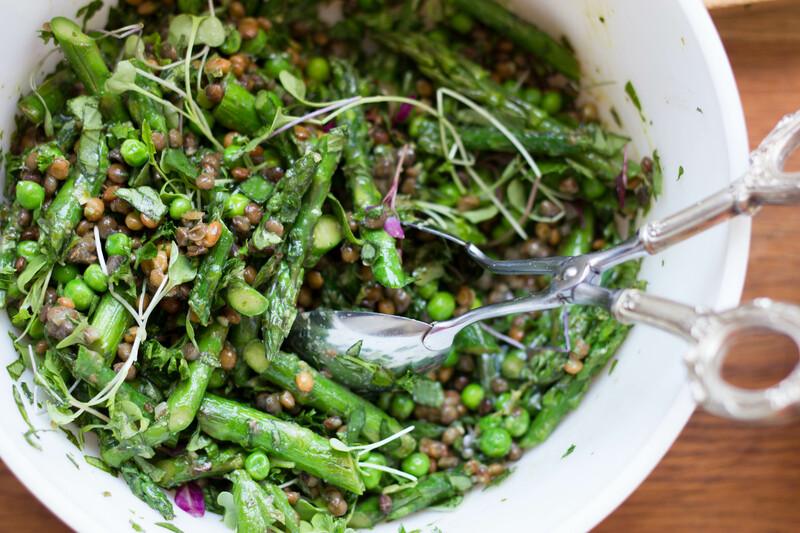 In accordance with the much-awaited change of seasons, this salad is perfect for a summer dinner outdoors. 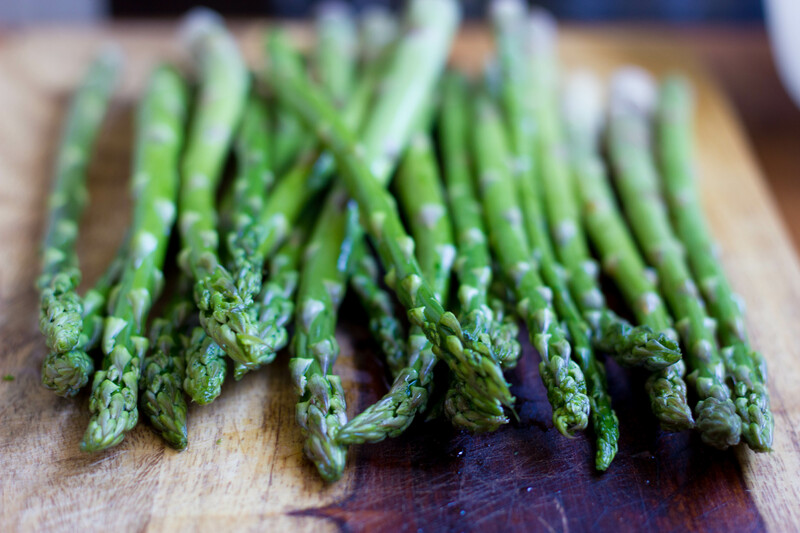 In a pan over medium heat, cook the asparagus pieces in 1 tsp of olive oil, stirring occasionally for 5 minutes and allow to cool. I like asparagus to have a snap. 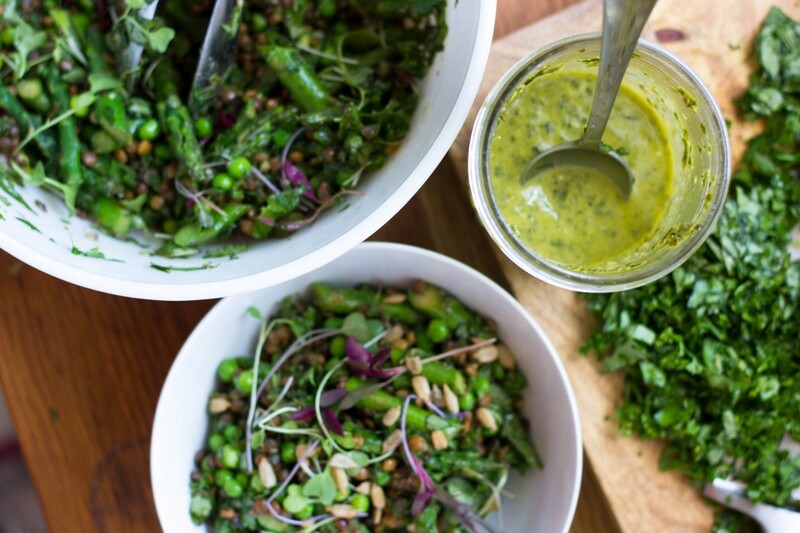 In a big bowl, combine the lentils, put 1/4 c. of salsa verde, the lentils, peas and asparagus and toss to evenly coat. Then add in the chopped herbs and greens, and if needed, more Salsa Verde and salt and pepper to taste. Serve and sprinkle sunflower seeds on top. Cheat Sheet: I didn’t have time to cook lentils, so I bought pre-cooked lentils from Trader Joe’s and used frozen peas. Â The next day, I had extra brown rice on hand, so I tossed it in to the leftovers to stretch them out. I Â make big batches of the Salsa Verde to have on hand throughout the week, it is worth its weight in gold (that may be an overstatement). I made this for dinner tonight. So delicious! I don’t like mint, so I used more basil.